Where did Mohsin Changezi go? The 35-year-old Mohsin Changezi surfaced on the horizon of Urdu literature only recently and took the institution of mushaira by storm. Despite his young age, he penned complex ideas, fully doused in classical topoi. He soon became one of the most sought-after poets in mushairas and was touted by many optimists as the next popular poet of Urdu literature after Atta Shad, who held the language’s mantle in Balochistan, and the inheritor of the legacy of classical giants. But then, his appearances at events reduced over time. He became known for his matter-of-fact persona and would leave podiums with audiences requesting him to continue, something I witnessed myself. With poetic meetings and conferences in general, and the Aalmi Mushaira of Karachi in particular, thin attendance, unruly crowd and organisational delays have become a staple. “Things weren’t that bad until around 2005. There were people who took literature seriously and the mushairas were encouraging. Then on, things have been a little rough, especially at the Aalmi Mushairas of 2009 and 2012. It’s very disappointing.” He mentions a recent such event from Lahore attended by Indian dignitaries as well. “There were few people in attendance except the guests. The moment the food was served, the entire hall was full,” he says. He started playing with words seeing his Urdu lecturer Nawab Khan in college. The teacher’s interest in poetry and theatric style inspired him to start writing. However, this inspiration ensued in a hiatus that ended with Changezi’s Nishan-e-Ghazal-winning Kufa-e-Shab Ne Jo Tabeer Ki Hadd Jari Ki that trumpeted his arrival. The year was 2000. Dr Inamul Haq Javeid, who heads the National Book Foundation, used to take out a monthly from Islamabad, which carried poetry of writers below the age of 50. Changezi sent in this ghazal that he had written. Karachi’s Aalmi Mushaira was seeing the peak years of its popularity in those days. Mohsin was asked to attend it but there was a problem. The stage was set and invites had already been printed, with Changezi’s name nowhere on the list. Senior poet Mohsin Bhopali still insisted Changezi fly from Quetta and participate in the mushaira. The order of recitals in a mushaira is serious business. Since the line-up for this event was already locked, the problem was when to let Changezi read. Saleem Kausar had just finished and the crowd was roaring in applause of the poet. After a moment of murmurs and nods, Changezi was summoned to the microphone. “Call it irony or luck but people generally pay attention whenever a relatively young and inexperienced-looking poet speaks into the microphone,” he says. He might be looking at a sizeable crowd whose eagerness would make anyone nervous but what forced him to swallow his tongue was the presence of the likes of Jaun Elia, Iftikhar Arif and Irfan Siddiqui on stage. He mustered up courage and fetched the piece of paper on which he had scribbled the same ghazal that he submitted to Javeid, with his recital leaving most attendees in awe. Changezi returned to Quetta and things were back to normal. A few days later he received a call from Islamabad, informing him his ghazal had bagged the first prize and that a cash award of Rs100,000 was waiting for him. This was followed by a string of mushaira invites that hasn’t ended as yet. The young Changezi made a huge impression on Jaun. The ailing poet visited Quetta on Changezi’s request and admitted him in his circle, granting him the status of a disciple. 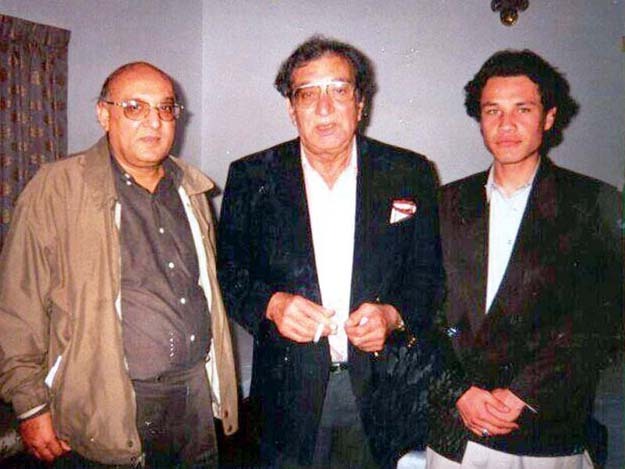 “Mohsin, tumhara Jaun bhai tum par apne baatin se naazaan hai,” Jaun wrote for him. Jaun’s death had a profound impact on Changezi. “His passing away left a void that I wasn’t able to fill for a long time,” he shares. Despite his grievances, Changezi didn’t give up the pen and has been writing consistently for the past 15 to 16 years and went on to publish about five collections. “All the other things aside, a poet’s fundamental job is to force himself to write. My new collection called Khali Kaghaz is almost ready. It should be out in five to six months,” he adds. Published in The Express Tribune, December 13th, 2015.